What is the BeerGun? well, It is a new easy way to fill beer bottles with sediment-free carbonated beer from a kegging system without excessive foaming. Beer foam is caused by the sudden change in pressure. Unlike awkward counter pressure fillers, the BeerGun does not pressurize the bottle to avoid a sudden change in pressure when filling, but instead relies on a very gradual reduction in pressure from keg pressure to the open air. By avoiding design features like ball valves and sharp bends in the flow path, the BeerGun gently reduces pressure on the carbonated beer as it flows through it, with the result being the cold carbonated beer that flows out has minimal foam, while still containing carbonation. 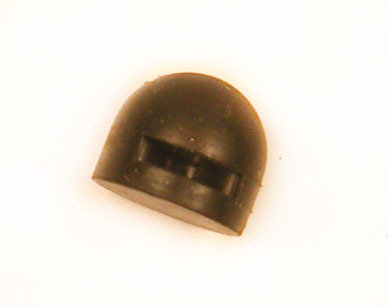 A purge button behind the trigger lets you first flush the bottle with C02 before filling if desired to eliminate oxygen in the capped bottle. What matters is the BeerGun is easy to use, and makes filling sediment-free beer bottles from a keg an easy job instead of a chore. For successful use, beer must be below 40° F. and beer bottles must also be as close the keg temperture as possible. This optional accessory kit provides everything you need to get your BeerGun up and running! 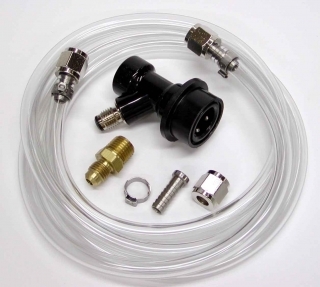 A liquid ball-lock disconnect, a 5ft length of hose for your CO2 line with 1/4" stainless flare connectors on each end, one stainless 1/4" disconnect and stainless clamp (for the 10ft beer hose that comes with the BeerGun), and a brass 1/4" NPT X 1/4" flare adapter for connecting to the CO2 valve on the BeerGun. Requires a spare CO2 port and shutoff valve on your regulator.